Marian Goodman Gallery is very pleased to announce our first solo exhibition of the work of Dutch artist Rineke Dijkstra, and her first one-person show in the United States. The exhibition will open on Tuesday, September 12th and will run through October 28, 2000. The gallery's hours are Monday through Saturday, from 10 am to 6 pm. 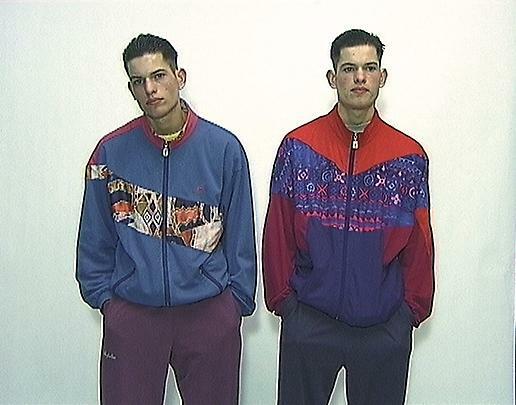 The Gallery will present Rineke Dijkstra's film Buzzclub, Liverpool, UK/Mysteryworld, Zaandam, NL (1996-1997) a "videoportrait" of the very young, filmed dancing in nightclubs. Also on view will be the artist's most recent body of work, the Tiergarten series (1998-2000), portraits of adolescent girls and boys photographed in the Tiergarten Park in Berlin, as well as in another park in Lithuania. This project began during Dijkstra's residency at the DAAD, Berlin in 1998-1999. Neither has been shown before in New York or in the United States. Over the past decade, Rineke Dijkstra has gained international acclaim for her portraits, mostly of adolescents, teenagers, and young adults, photographed in various settings around Europe and the United States. In 1992, she began a long-term project called Beaches. Caught in their rites of passage from puberty to adulthood, young girls and boys are photographed full figure in bathing costumes, standing against the sea. The resemblance between teenagers from different countriesÑthe Netherlands, Poland, England, the Ukraine, Croatia, Belgium, and the USA—creates a catalogue of similar types and raises questions about identity and nationality, without necessarily trying to answer them. Each portrait depicts what is both universal and personal within individual experience. Dijkstra's new works, The Tiergarten Series and Buzzclub, are both marked by a tension between the knowable and unknowable, the intimacy and aloofness of the subject. Each offers a study of the "face" of youth. Whether confrontational or wary, confident or insecure, posed or relaxed, shy or outgoing, Dijkstra's subjects reveal an instantly recongizable portrait of this age of transition. Other series of works by Dijkstra include photographs recently commissioned by the Anne Frank Foundation in Amsterdam for their new building: portraits of adolescent schoolgirls with their best friends, a poignant reminder that any girl could be an "Anne Frank" in unlucky circumstances. These portraits were all taken in Berlin (though Dijkstra has since expanded her subjects to include Milan, Barcelona, and Paris). Prior to that, she created two series: Mothers, which consists of portraits of new mothers in Holland, shot in their own homes, holding their new born babies; and Bullfighters, photographs of matadors in a Portuguese village, taken at the same times as Mothers. Both are portraits of gender and, as the artist says, "extreme physical effort. You can't give birth without it, while the men search for it as a kind of adventure. Both are exhausting and life-threatening actions." (Interview with RD, Flash Art, Nov.-Dec. 1998). Rineke Dijkstra is the 1999 recipient of the Citibank Photography Prize. She has won numerous other awards, including the Kodak Award Nederland (1987); the Nomination for Young European Photographers (1990); the Art Encouragement Award Amstelveen (1993); and the Werner Mantz Award (1994). Her work has been exhibited widely in solo exhibitions at such institutions as the Museum Boijmans van Beuningen, Rotterdam; the Museum van Hedendaagsekunst, Ghent; and the Stedelijk Museum, Amsterdam; the Sprengel Museum, Hannover; the Museum Folkwang, Essen and Galerie der Hochschule fuer Grafik, Leipzig; and Le Consortium, Dijon. She has been included in numerous group exhibitions, such as Eurovision at the Saatchi Gallery, London; Let's Entertain at the Walker Art Museum, Minneapolis; Breathless: Photography and Time at the Victoria & Albert Museum, London; How to Look At It at the Sprengel Museum, Hannover; Regarding Beauty at the Hirshhorn Museum, Washington, DC; and Modern Starts: People, Places, Things at The Museum of Modern Art, New York . Rineke Dijkstra was born in 1959 in Sittard, The Netherlands. She lives and works in Amsterdam.